Maria H. Brown "Oma", 82, of Topeka, passed away on Friday, November 2, 2018 at the Topeka Presbyterian Manor. She was born May 11, 1936 in Bitburg, Germany, the youngest of 11 children of Johann and Elisabeth (Gruber) Neumann. Maria had resided in Topeka since 1976. She was employed by J.C. Penney for 19 years before retiring. After her retirement she was employed by Walgreens and was a member of the New Beginnings Singing Group. She sang "Silent Night" in German solo at the Festival of Trees every year. She loved to cook and was a great baker. 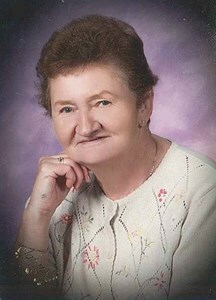 She enjoyed the outdoors and spending time with her grandchildren. Anyone who met her loved her smile and hugs. Her hobbies included gardening and knitting. Scarves are all over town "made by Oma". She loved to travel especially back to Germany. She learned to drive at the age of 50 and found a new freedom! She was a devout practicing Catholic. Maria married Delton Brown on February 18, 1958 in Bitburg, Germany. Survivors include their children; Darlene Brown, Patricia Menke, Sylvia Chaffin, Gary Brown (Christine) and Lisa Emerson (Cale) all of Topeka; eight grandchildren: Elizabeth Dodds (Kris), Jennifer DeFreece (Nic), Timothy Rutledge, Stephanie Sorell (Houston), Samantha Menke, Kylie Emerson, Tharin Brown and Cole Emerson; six great-grandchildren: Parker, Piper, Haylie, Jayci, Ryli and Rory; one sister Regina Neumann, one brother-in-law Gino Scaccia, and two nieces, all of Germany; and brother-in-law Ronald Brown (Mary) of Louisiana. Maria was preceded in death by her parents; nine siblings; and her husband Delton Brown, Ret. USAF on December 8, 1984. A Rosary will be recited on November 9, 2018 at 10:00 a.m. followed by visitation. The memorial service will begin at 11:00 am at Dove Southeast Chapel, 2843 SE Minnesota Ave. Inurnment will take place in Mount Hope Cemetery. The family would like to thank all of the staff at Presbyterian Manor of Topeka and Great Lakes Hospice Care for treating her like family. Thank you for your love and care of our mother. Add your memories to the guest book of Maria Brown. Janet and Maria worked together at J.C. Penney for several years. Maria was an excellent mentor for her, and they enjoyed a wonderful friendship. Janet and Larry shared speaking German with Maria. What a delight! When Maria worked at Walgreens at 10th and Topeka Blvd., Larry was working at the Docking State Office Building and would shop at Walgreens. Maria and I would continue to speak German. We extend to you, her loving family, our deepest sympathy. You are in our prayers . May our loving God surround you, and may friends and family be supportive as well. I am so sorry for your loss. Your sweet Mom/Oma will be dearly missed. She was a kind and loving lady. Her family was her world and she cherished spending time with her loved ones. May your treasured memories bring you comfort. I will keep you in my thoughts and prayers. Maria. Was a good Grandma to my granddaughter. Jennifer my heart is out for you and the rest of the family. She will be remembered always..your Grandpa Sadler. And grandma as well. ???? Prayers sent to the family of Maria Brown. Such a lovely and fun woman. My Mom ( Ingeborg Isaacs ) and Maria were such good friends. Trips to Fort Riley with the two of them was such fun. She will be sadly missed. It is so hard to lose someone we love so much. Maria was such a sweet lady...I remember her from when she worked at Penneys and helped me. She will be remembered with fondness and love by many people. Prayers for family and friends.